Do you DROOL for rice? Is it your staple meal? Are you COMPLETELY a ‘never say no to rice’ person? But do you also dislike the hassles involved in cooking it? Well, you don’t need to worry about the rice being overcooked or undercooked with the ALL NEW rice cooker! 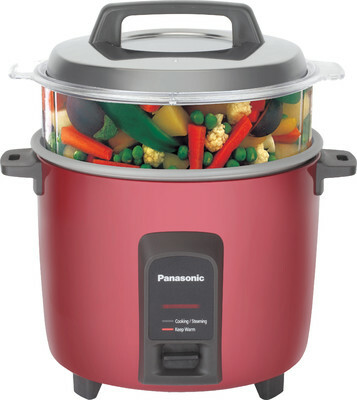 The Panasonic rice cooker is built beautifully. It not only cooks rice but is a multipurpose item as it comes with a nonstick pan that prevents the food particles from sticking and also a steam basket that can be used to steam food. The appliance is absolutely hassle free as it doesn’t require you to monitor your food regularly. It comes with auto cooking function which tells you when your food is cooked to perfection and also keeps it warm. When I received the package it came with a warranty card, a manual and a main unit. Along with it came a spatula and a measuring cup. Talking about the cost, I bought it from Flipkart for Rs 2789, along with a one year warranty, which is a great price as compared to other similar products available in the market. The only flaw this product has is that while using the steaming basket, the mode automatically shifts to warm and if the basket is not removed, the rice starts to burn. Overall the product is very good and I am very satisfied with the product. I would highly recommend my friends to buy it. Add water to pan. Place steam basket inside the pan. Add vegetables (place into dish if required). Cover unit, plug in cord, and turn on unit to COOK. Time the cooking manually. Unit will automatically switch to KEEP WARM/OFF, should water evaporate. Stir vegetables occasionally. Turn off cooker by unplugging. Unit may also be switched to KEEP WARM/OFF. Remember that vegetables will continue to cook on KEEP WARM. There must be water in the pan. Remove vegetables, then the steam plate, and finally pour off the water.